Art Flair has created a new product called Blaze that can supposedly help you make $408 per day online. 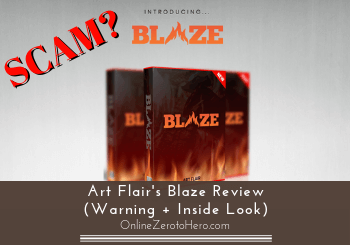 But is Art Flair’s Blaze a scam, or is it a great way to make money online? 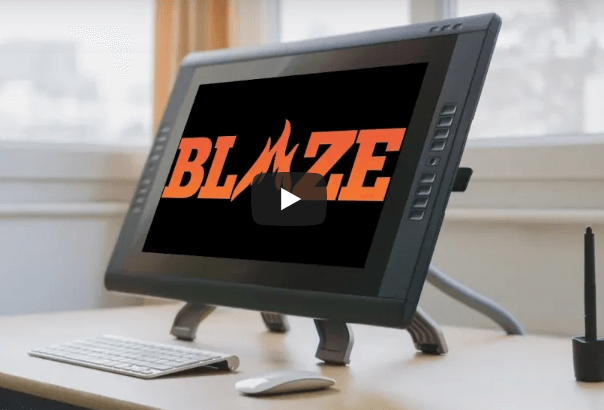 I have bought and tested this program myself, and in this Blaze review I will show you exactly what it offers. Let me reveal right away that there are A LOT of things you are not told, and if you think it is a fast and easy way to earn online, you will probably be disappointed. But let me show you what Blaze really offers, and then you can judge for yourself. You can learn a bit from the Blaze training – but not a lot unless you get the expensive upgrades. The training is superficial and does not at all teach you an easy copy paste way to make money online, as the sales page claims. It is definitely NOT a product I recommend. What is Art Flair’s Blaze and what does it offer? The Blaze method is a program by Art Flair, who also has launched a lot of other online money making opportunities in the past. The Blaze method is supposedly a way to learn his method to easily make more than $400 per day. You are not told much about how this is going to happen. All you are told is that it is a very fast method, and you can get started in just 45 minutes and will make money very quickly. You can supposedly set everything up in just 45 minutes – this is a lot of BS! You are even told that it is mostly just copy and paste, and it does not matter, if you do not have any previous experience. Reading claims like this always make me suspicious. I have years of experience in internet marketing, and I know that there is no magical way to make money by just copying and pasting for a few minutes. I however still decided to give Blaze and Art Flair the benefit of the doubt and joined to test it. Let me reveal right away that if you expect to be able to make $400 per day after just setting things up for 45 minutes by following the Blaze method, you will be VERY disappointed. But let me show you what it really offers, so you can see and judge for yourself. I got Blaze for just around $10 – so it was very cheap. Be aware that the counter that shows that the price will go up as soon as it hits zero is just a sales trick to get you to buy fast. So do not let it stress you out. Anyways, after having paid, it was quite a long process to get to the actual members area. Before getting to the members area and the training you have bought, you have to go through 5 sales pages with upgrades you are encouraged to buy. Each of these sales pages has a short video explaining exactly why you should buy this upgrade and a whole sales page that is very convincing – just like the sales page of Blaze itself. This is very annoying to me, and when you are hit with a bunch of upgrades even before you have seen the actual program, it is to me a very bad sign. As you can see, it can end up being a lot more expensive to get the Blaze methods than it initially seems like. You of course do not have to buy these upgrade, but the sales pages are really pushy, and the whole system is build around getting you to buy them – this is how Art really makes money on the program. Be aware that even though you are told you have to buy the upgrade right away not to miss out, you should not worry. You do not have to buy them right away and will can get them later, if you should decide to. What was a little scary to me in the explanations and sales pages of these upgrades was that it already here became clear to me not to expect much of the actual training. Art is for example more or less saying about the traffic upgrade that you need this to make the program work. Art is basically admitting that you should not expect traffic results from the basic training. He says that they will show you traffic methods, but chances are you won’t be able to replicate what they do. Therefore, you should get this upgrade. A statement like this completely contradicts what is being told on the initial sales page. Here you are told it is something anybody can do by just copying and pasting a bit. And now you are suddenly told you probably will not be able to replicate what they do. This seems like a lot of sales BS does it not? So it is a long process before you even get to the members area, where you can find the training you initially bought. Let’s look at what you then find, when you finally get there. Is the Blaze training worth it? I was honestly a bit annoyed with Art Flair and the Blaze method even before getting to the members area, because I had to go through so many pushy sales pages before getting there. But I decided to still give it a chance and check out the training. Once you are in the members area, you get access to 11 training videos. You get access to 11 small training videos in the Blaze members area. They are between 1-20 minutes each. In total there is about 90 minutes of video training. This is all you get. So according to the initial claims on the sales page, you should be able to just copy and paste what is shown in these videos, and then you will be able to make $400 per day – sounds amazing if it was this easy right? Well, unfortunately it will not be that easy. But before getting to this, let me just go over the topics covered in the videos. These topics are all important to create a successful online income. What I agree with is that Art explains how affiliate marketing is a great way to make money online. I completely agree with this, and it is also my preferred way. Also, he mentions an important aspect is to have a website and a blog – I also agree with him in this. The problem is just that the training is EXTREMELY superficial. It is easy to say it is important to have a website and a blog. But if you are new to making money online that does not help you much. He just kind of mentions it and shows you a couple of examples, of where you can buy a domain name. But that is it – you are not told how to build a website or anything. It is definitely NOT as easy and copy paste as promised. This is just one example. Another example is the training about traffic. Traffic is very important to make money with affiliate marketing.